Glowsticks are essentially plastic tubes that hold two liquids, one in the plastic casing and one inside a glass vial that floats in the first liquid. When you bend a glowstick, you break the glass vial which allows the two liquids to mix. This causes a chemical reaction that’s bi-product is light without heat. The term for the reaction is chemiluminescence. Glowsticks.co.uk glowsticks contain two chemicals; hydrogen peroxide and tert butyl alcohol, these mix with a fluorescent dye to achieve the coloured glowstick effect. It’s the hydrogen peroxide that is held inside the glass vial. Non of the substances used are flammable or toxic, in fact to put them in perspective, hydrogen peroxide is used as a hair dye (hence the term peroxide blonde) and in laundry detergent and tert butyl alcohol is used in the manufacture of perfumes and cosmetics. What else are glowsticks known as? What sizes are glowsticks available in? 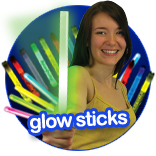 Essentially glowsticks are available in a number of sizes and widths the most popular being the standard 6” glowstick. 4” glowsticks are a cheaper alternative for smaller budgets, and the increased popularity of night sports such as night golf and of course parties and fundraising have seen the demand grow for 22” glowsticks or glow necklaces and 8” glowsticks or glow bracelets. 1.5” glowsticks are also available although are not recommended to children due to their size. This size is typically used for fishing. Aside from traditional glowsticks, glow products come in all shapes and sizes, from glow straws and glow cups to personalised badges and hilarious glow glasses. What happens if my glowstick leaks? Don’t panic! The liquids inside our glowsticks are non toxic and are not harmful to humans although they may slightly irritate the skin. If you come into contact with the contents of a glowstick simply wash the affected area with clean water. Whilst the fluid in a glowstick is non toxic to you and I, the chemical will however act as a plasticiser which means that it will soften plastic materials causing them to warp and so it’s advised to keep glowsticks away from plastic products or painted surfaces. Please do bear in mind that with correct use and under normal circumstances you are very unlikely to come into contact with the contents of a glowstick. Are all glowsticks the same? OK so glowsticks are pretty simple products so are they all the same? The simple answer is no. As with all products there are varying levels of quality available - some manufacturers try to make the products as cheaply as possible with no regard to quality and yet for other manufacturer’s quality and safety is the most important factor. 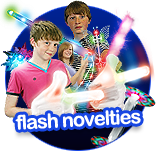 The materials used to make the glowsticks can be made cheaply with a focus on minimal cost or they can be made with the intention of making a good product. Our advice is buy from a reputable source and stay clear from the 'bargain basement' as you don’t know what you may be purchasing. If it’s really cheap you now know why. How do I activate a glowstick? To activate your glowstick regardless of size, you simply need to apply gentle pressure to the centre of the glowstick in a similar motion as if you were to break a pencil in half. This will then break the vial and allow the chemicals to mix creating the glow. Simply give it a shake to complete and enjoy your glowstick for a minimum of 8 hours! What can glowsticks be used for? Glowsticks are waterproof, don’t need batteries, do not generate heat, are inexpensive and will tolerate high water pressure which makes them perfect for a wide range of industrial applications. However they are also useful to us with a wide range of uses such as fishing, caving, diving, camping, night golf, night sports, high visibility, table decorations, flower arranging and of course fundraising and parties. Glowsticks are also the only light source considered to be safe for use after natural disasters and in emergency situations as they don’t use electricity and don’t produce any sparks making them the only light option in explosive situations. How do glowsticks work with night sports? Night sports are a relatively new phenomenon and are becoming increasingly popular with sports such as night golf and night football leading the way. Glowsticks are as crucial to these games as the ball itself as they allow players to be seen and highlight key areas such as golf fairways, holes to aim for and goal mouths. Glow necklaces and glow bracelets are used to identify players and distinguish between teams, whilst in the case of night golf; glowsticks are applied to golf buggies, flags and to mark out hazards. Can a glowstick be used again and again? Glowsticks are really a one use only product; however it is true that the effect can be stalled by placing the glowstick in the freezer. Freezing an activated glowstick won’t reverse the chemical reaction but it will dramatically slow it down allowing you to freeze your glowstick and use it another night. How does heat affect glowsticks? As the extreme cold will slow down the chemical reaction in a glowstick thus preserving the glow, the opposite effect occurs when you place a glowstick in warmer temperatures. If you place a glowstick in warm water it’ll speed up the chemical reaction increasing the intensity of the glow. Whilst doing this the glowstick will burn much brighter, but the life of the glowstick will be greatly diminished as the chemical reaction ends much quicker. Can glow products be turned off once activated? A glow product cannot be reactivated or turned on or off, however the freezer trick will mean that you can prolong the life of your glow products if desired. How do I store non activated glowsticks? Store non activated glowsticks in their packaging in a cool, dark place and ensure that they’re out of reach of young children and animals. What is the shelf life on a glowstick? 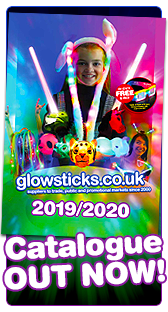 Glowsticks.co.uk glowsticks have a minimum two year shelf life from when you bought them so you can keep a few handy around the house in case of a power cut or a last minute party. How long will a glowstick glow? Standard glowsticks will glow for eight to twelve hours and these tend to be the most popular kind of glowstick for everyday use. However, in ideal conditions, some colours will glow for over 24 hours! Are glowsticks good for fundraising? Absolutely! Glowsticks, glow necklaces, glow bracelets and glow novelties are all fantastic for fundraisers, as they’re relatively cheap to buy in large quantities, return great margins and require little sales push. Glow products literally sell themselves! Have we missed anything? If you have a question about glowsticks that we haven’t anticipated then please contact us.